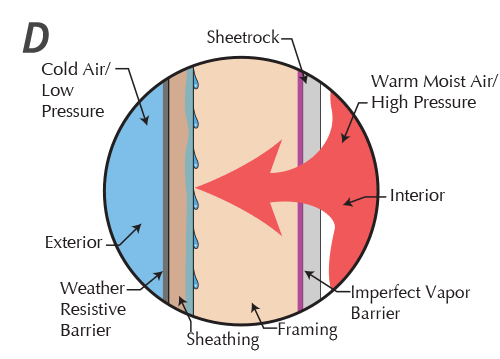 The Temperature and Moisture Management Relationship | Masonry Technology, Inc. 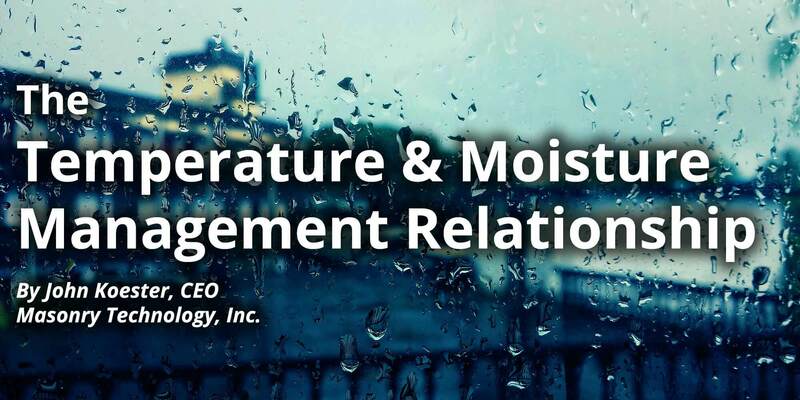 There is nothing new about the relationship between temperature and moisture management. 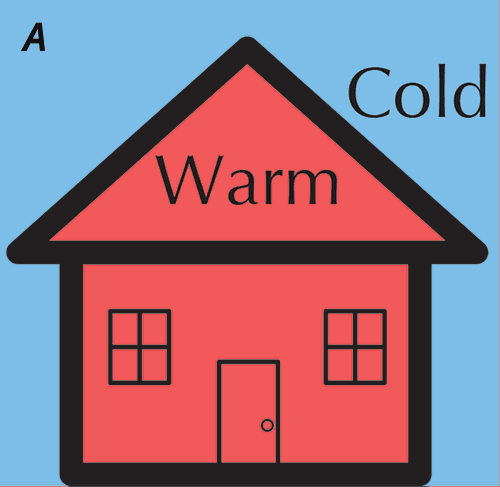 The phrases “wet and cold” or “warm and dry” are ingrained in animal psyche for good reason. Anyone who has had a bad experience of being very cold and wet and then had the good fortune to get warm and dry before succumbing to hypothermia has not forgotten the incident. As Jack London wrote, “The Wild still lingers in us.” All members of the animal kingdom instinctively know that being “wet and cold” is a potentially disastrous condition. is denser than air and transmits temperature 25 times more efficiently. When you are wet, the ambient air temperature can get to you more readily and your body can lose temperature to the surrounding ambient air more easily if it is at a lower temperature than your body. It’s like sticking your hand into a 400-degree oven. We’ve all opened an oven door and repositioned something being cooked. If we didn’t touch a hot surface with our hand or arm, we did it without a problem. However, how many of us would plunge that same hand into 212-degree boiling water? 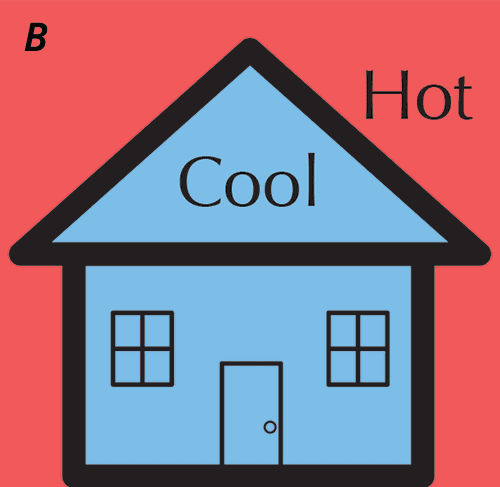 Good thermo insulators have a lot of air molecules in proportion to other dense molecules and these air molecules are effectively positioned between the more dense molecules to make this separation. A good example of this is the cardboard sleeve that slides around a paper cup of hot coffee making it possible to comfortably hold the steaming beverage. Insulation that has been stored in an exposed location on a jobsite can be installed in a damp/wet state. Liquid water can egress into the exterior building envelope during and after the construction phase. 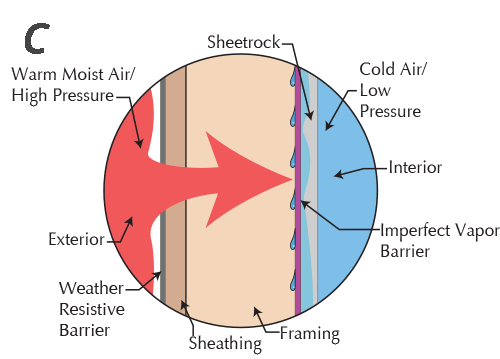 Moisture in the form of water vapor can enter the building envelope from the exterior and interior. 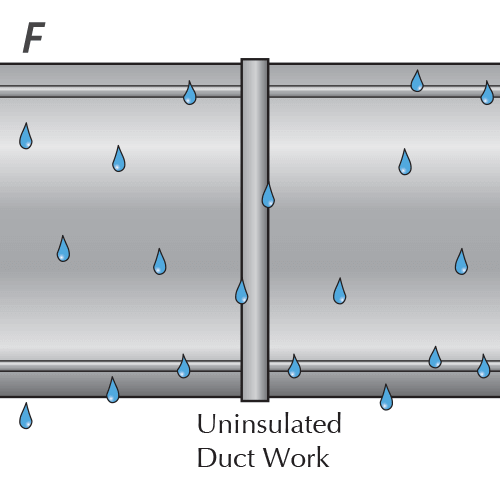 Poorly insulated heating and air conditioning ductwork can condense and drip liquid water. A 1/8” void became the accepted minimum standard because capillary action could take place in a void of less than 1/8”. A 1/8” separation at the backside of the board stock rigid insulation from the wall sheathing causes the least decrease in R-value while maintaining effective drainage characteristics. A 1/8” void allowed moisture that attempted to accumulate, to effectively drain down and out of the wall. 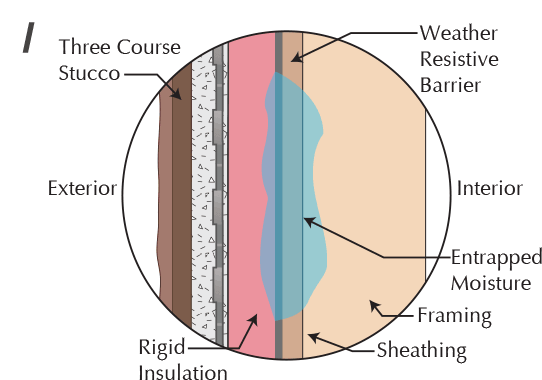 This is not a feature of EIFS that has been widely promoted or discussed with the buying public because EIFS qualify by code as a “barrier system”. 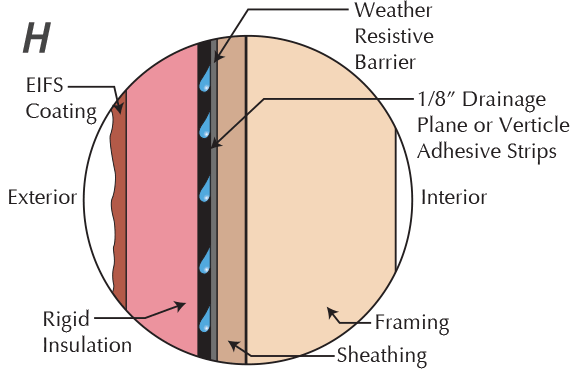 A barrier system does not allow moisture to penetrate into the building envelope and accumulate; however, the evidence shows that moisture did penetrate these systems and accumulate within the system leading the EIFS industry to add a drainage plane to overcome the entrapped moisture problem that was common with the early EIFS. 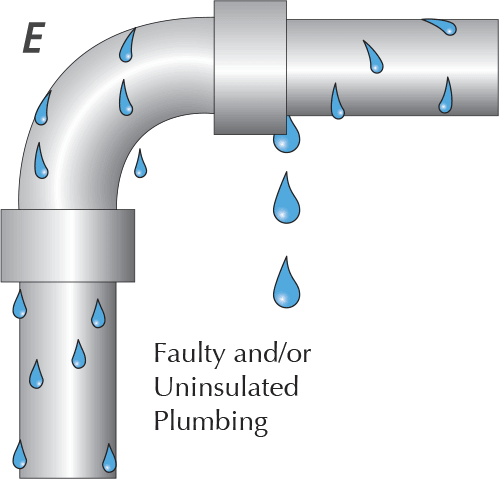 Because this information was at one time proprietary and not widely disseminated, the requirement for and effectiveness of a drainage plane as a remedy for entrapped moisture is not fully appreciated by the construction industry. The intent of this article is not to single out and disparage the EIFS industry. In fact, it should be seen as just the opposite. The EIFS industry has made real strides in successfully remedying the entrapped moisture problem in their system by adding a drainage plane. Also, the entrapped moisture problem is not exclusive to just one type of building envelope system. Entrapped moisture conditions that are not addressed can, and will, diminish any construction detail. Does rigid insulation with taped seams qualify as a WRB? 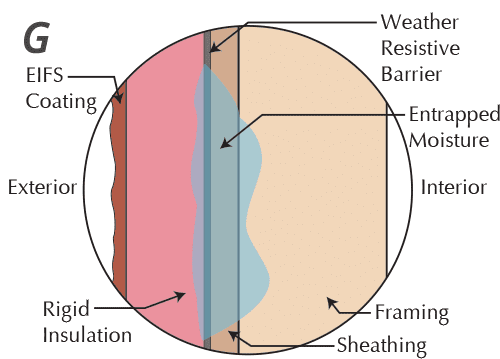 Is rigid insulation with taped seams a vapor retarder? 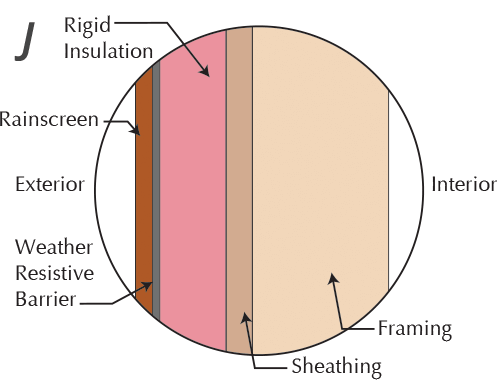 It is MTI’s position that most types of board stock rigid insulation with taped seams are vapor retarders. If this is the case, then the consequences of two or more vapor retarders (as components of the same exterior building envelope system) are very real. 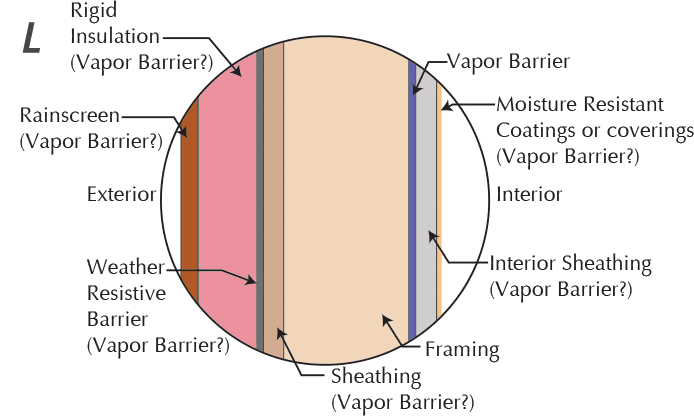 two or more vapor retarders in an exterior building envelope? The answer is “nothing” if the amount of entrapped moisture is very small; and if there are no other construction details involved that the entrapped moisture can damage leading to rot and/or microorganism growth. Of course there are problems with the “if” and the “not knowing you are specifying/installing two or more vapor retarders in the same building envelope” scenarios. Denial and ignorance could be the title for most moisture management articles and the conclusion to most entrapped moisture problem forensic reports. “I do not have to worry about moisture being trapped in the exterior building envelope because it can’t get there,” is Denial. And “I didn’t know that material was a vapor retarder,” is Ignorance.